Sunway played host to more than 60 A Level teachers from various Cambridge GCE A Level Centres from Peninsular Malaysia, Sabah, Sarawak, Singapore, Indonesia, Thailand, Vietnam, Laos, India and China for the recent two-day Cambridge International Exams (CIE) Intermediate A Levels Professional Development Training Courses at Sunway. The 2-day Professional Development training for teachers of the Cambridge syllabuses of Intermediate Cambridge AS and A Level in Accounting, Business, Economics, Law and English Language were conducted by CIE trainers selected by the CIE training department in the UK. The English Language subject was introduced as a new subject. The trainers were Paul Sengebusch for Accounting, Jane King for Business, Colin Bamford for Economics, Susan Ramsay for English Language and Fiona Enright for Law. In the course of the two-day training were various breakout sessions which included an overview of different teaching methods and strategies, discussions on formative and summative assessment, creating schemes of work and lesson plans. 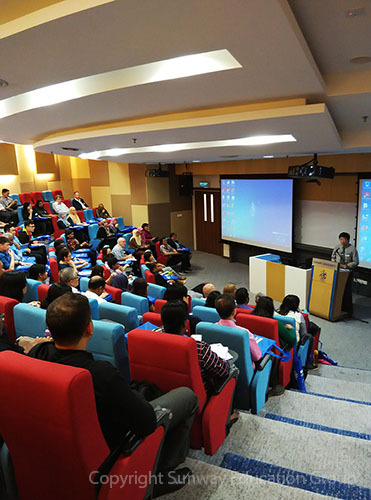 Representing the Sunway Education Group was Cheng Mien Wee, Director of Pre-University Studies, Sunway College and Executive Director of Sunway International School. Cheng welcomed all the delegates to Sunway. Ng Kim Huat, Senior Schools Development Manager, Cambridge International Examinations in his speech informed the teachers on the new development where teachers have the opportunity to become trainers and examiners. The few who have been selected prior to the two-day training, shadowed the senior trainers as assistant trainers. Ng also informed that Malaysia is one of the few countries to be allowed to recruit trainers and examiners, further affirming the quality of the teachers in the country. CIE conducts approximately 5 Professional Development trainings per year covering various programmes from Primary Checkpoint to A Level.